Closets are often overlooked spaces in the home, but having your clothing and accessories not just organized, but displayed in a pleasing or even dazzling way, is a true luxury. 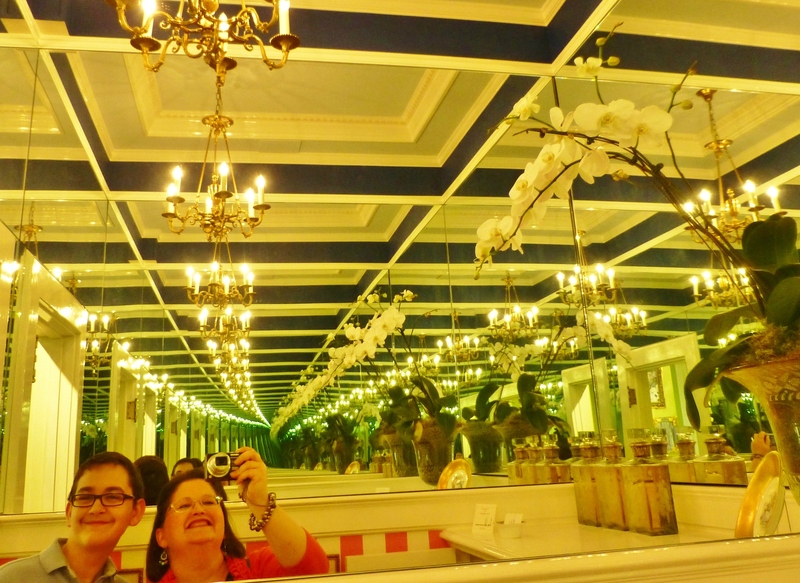 I decided I’d better get back to sharing with you about my wonderful visit to Mansion in May (yes, I know it’s already August and I’m still posting about this mansion, but I have so much left to share with you!). Blairsden was truly one of the best designer houses I have ever visited, and the designers did such amazing work. Today I’d like to show you just a few images of various small spaces that were ‘in between’ the major rooms of the house. At first glance, this is just your average dark wood closet (and I must apologize, because my photograph does not do it justice). On further inspection, you’ll notice the drawers are just amazing. 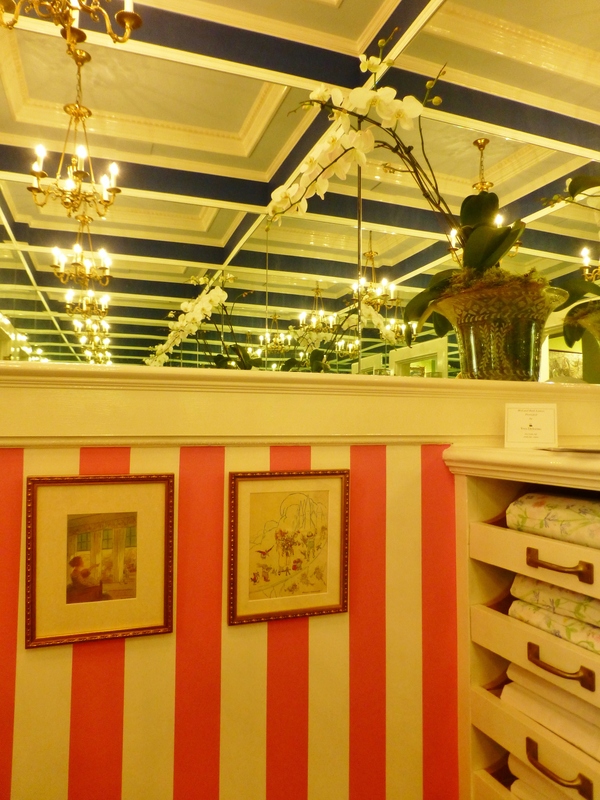 They feature a Sirocco pattern printed on mirrored panels–very glam. 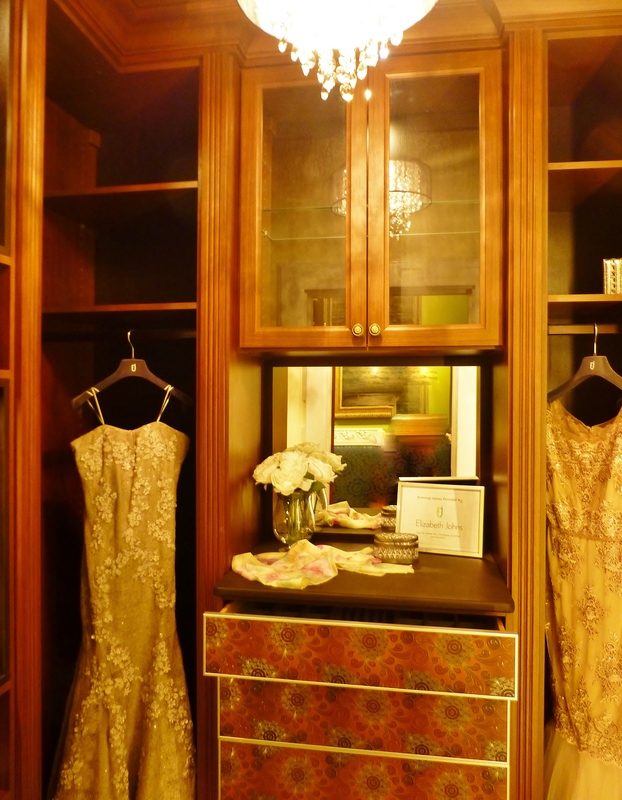 The gowns in this space were also magnificent–how luxurious to have a closet designated just for evening gowns! My son, Grady, and I took a selfie in the linen closet. By lining the small space in mirrors, this room becomes a dazzling treat for the eyes. What a memorable space! Check out the before image of the linen closet on the second floor of Blairsden. This designer is a genius! Here’s another detail, showing the wide pink awning stripe adjacent to the pull-out shelves for storing linens. What a fantastic closet, featuring the illusion of never-ending space. In this formal dressing lounge, guests can change into their finest attire for a gala or ball. 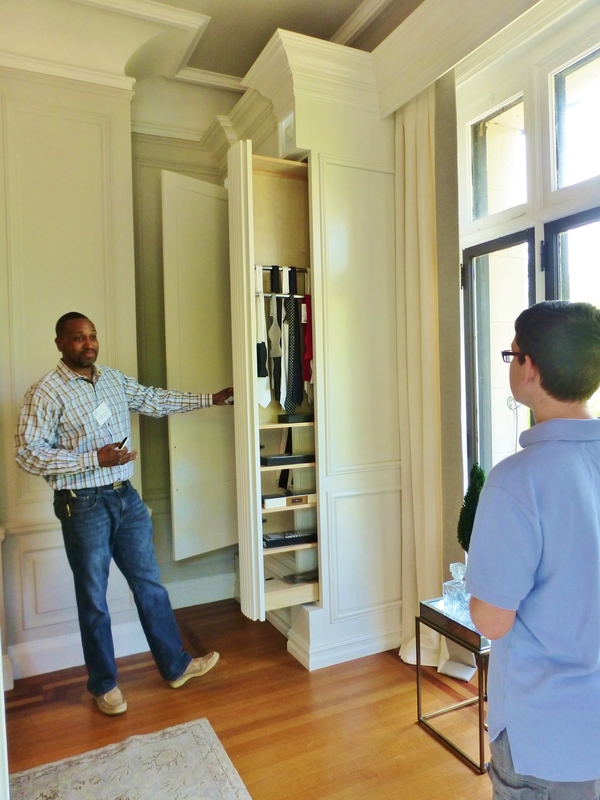 An 18’x23′ spare bedroom was transformed into a dressing room fit for royalty. Devoe Martin from Affordable Closets Plus shows Grady the innovative storage solutions for gentlemen’s ties and accessories. All the cabinetry is finished in a crisp white and the small amount of walls remaining (including the ceiling) are painted a soft gray. Trim work and moldings are applied generously to the cabinetry, to provide interest. I love the chunky cove molding at the ceiling, don’t you? So elegant! 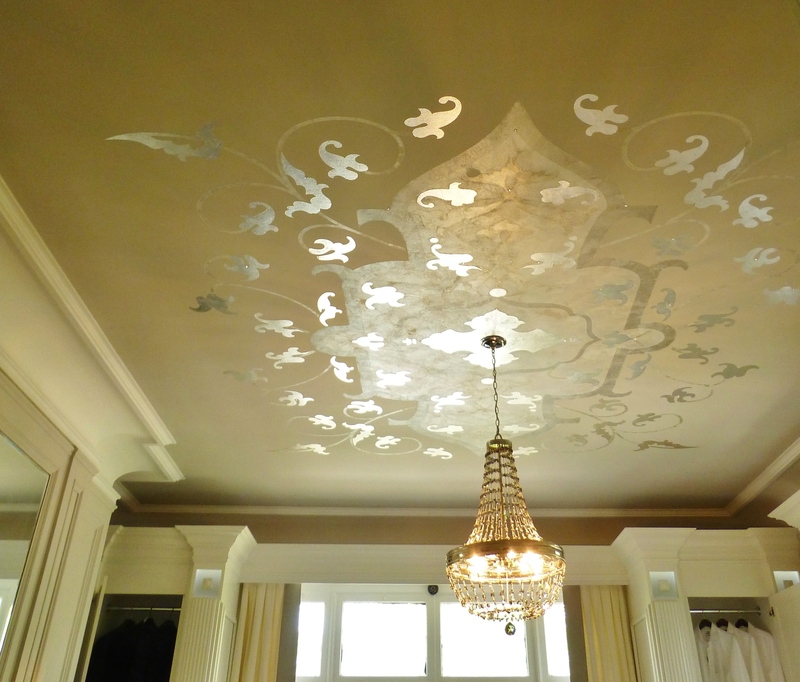 The amazing painted ceiling in the formal dressing lounge, features metallic and pearl finishes. It even has sequin embellishments! Can you see the back lit blocks at the top of the cabinets? Fluted pilasters (which offer pull-out storage) are featured at the sides of the cabinet doors, and the back-lit medallions really draw your eye to these architectural details. What a great feature to add interest to the white cabinetry throughout the room. This image is from a Press Release by Affordable Closets Plus, which you can read by clicking on this image. You can see the whole room here, with its double sided seating in the center and the original gray-veined fireplace mantel. Until next time, when I’ll take you on more of my exciting adventures, please post your comments telling me what you think about these sumptuous closets. I always love to hear from you, and I’m even more happy if you share my blog and tell your friends about me…I need all the friends I can get! This entry was posted in Architecture, Decorating, Designer House, Interior Design & Decorating, Mansion and tagged Awning Stripe, Blairsden, Closets, Dressing Room, Gray, Home Decor, Linen Closet, Mansion in May, Mirror, Mirrored, Robinson interiors, Showhouse. Bookmark the permalink.